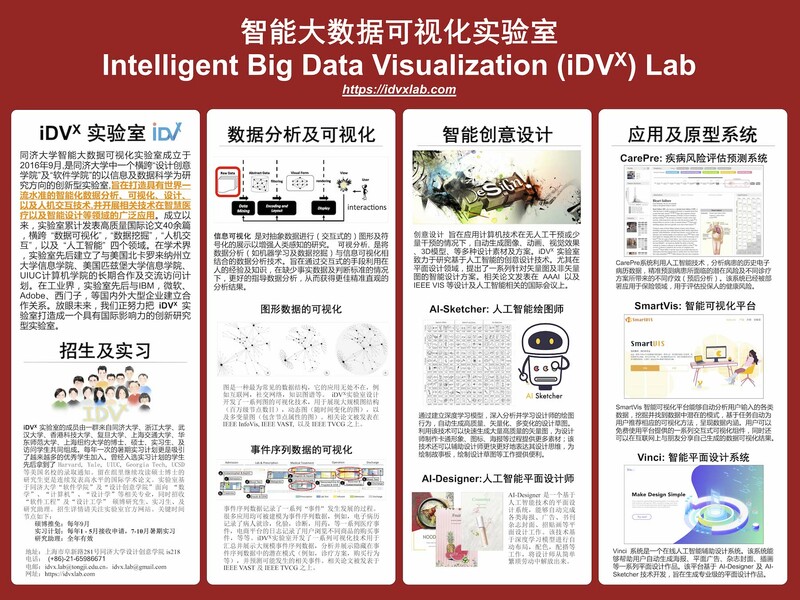 iDVx Lab is a joint research lab in both College of Design and Innovation and the School of Software Engineering at Tongji University, Shanghai, China. The lab was founded in 2016 and focuses on the data science related research areas, with the goal of developing the state-of-the-art techniques in the fields of intelligent data analysis, visualization, design, and human-computer interaction. We apply these techniques to various application domains, such as health informatics and AI supported design. iDVx lab has a strong research and innovation capability. During the past years, over 60 papers were published by the lab members in top-tier journals/conferences and over 40 patents have been filed. Our summer internship program has trained a number of outstanding undergraduate students who successively received the admission from top universities such as Harvard, Yale, UIUC, NYU, Georgia Tech, UCSD, UC-Davis, and UCSB. In academia, iDVx Lab has been closly cooperating with University of North Carolina at Chapel Hill, University of Pittsburgh, Arizona State University, and the Hong Kong University of Science and Technology in a variaty of research projects including intellegent healthcare, data analysis, and information visualization. In industry, iDVx lab is a long term collaberator of IBM, Microsoft, Adobe, Siemens and Alibaba. 博士学位申请人可通过同济大学 “博士生考核制” 免试录取，具体考核标准请参考同济大学 "研究生招生网" 以及 "信息公开网" 于12月前后所发布的相关通知。 2018年度考核工作已结束，考核标准如下: 设计创意学院考核标准，软件学院考核标准. 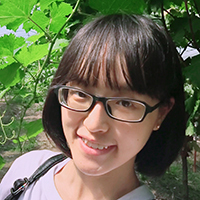 Professor Nan CAO is invited to give a talk about "Anomaly Detection in Interactive Visual Analytics" at Tsinghua University. 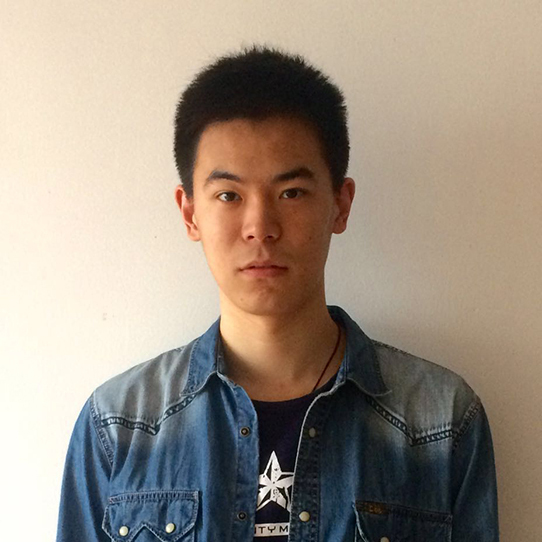 Professor Yang YANG from Zhejiang University is invited to give a talk about "Deep Mining in Social Media" for our students. Master student Xin YAN presents our paper entitled "AI-Sketcher: A Deep Generative Model for Producing High Quality Sketches" at AAAI 2019, Hawaii, US. We summarize our work in 2018 and publish a new version of our poster. Our paper entitled "Visualizing Uncertainty and Alternatives in Event Sequence Predictions" is conditionally accepted by SIGCHI 2019. Our paper entitled "AI-Sketcher: A Deep Generative Model for Producing High Quality Sketches", is accpeted by AAAI 2019. 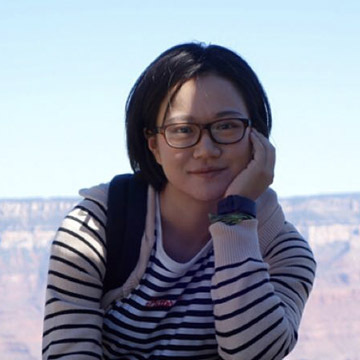 Assistant researcher Yang SHI receives young scientists fund of the national natural science foundation of china (NSFC).